The second round of our Digital Voices programme is underway. 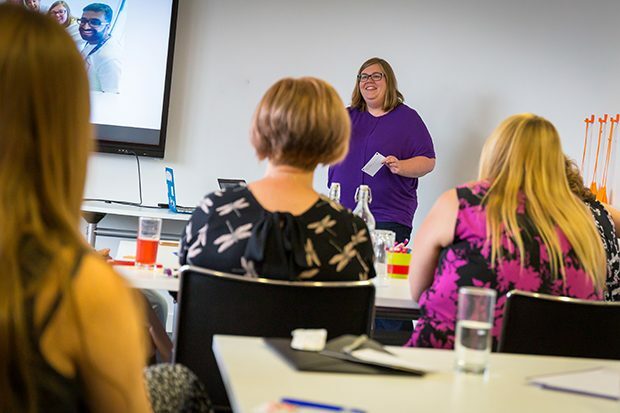 It’s a 5-month programme of learning and development opportunities designed to help women in DWP Digital develop their skills and confidence and find their digital voice. 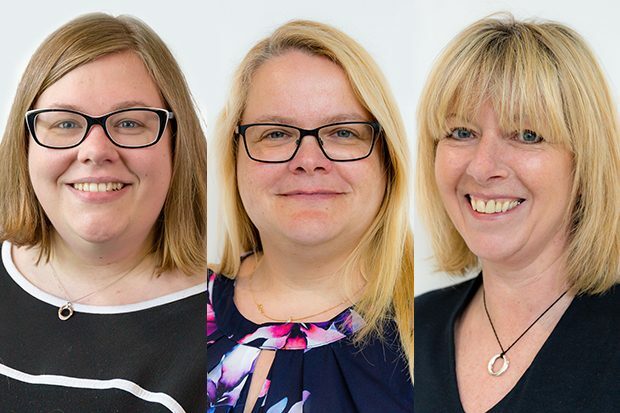 Six months on, Debbie, Jane and Jane (3 graduates from last year’s cohort) talk about how the experience shaped them. “I look back on Digital Voices as one of the development programmes that’s had the greatest effect on my career. It’s not a magic solution, but it gave me so much food for thought and so much awareness of how to cope with the issues I was struggling with before. For example, I went to a recent Women in Digital event in Leeds where I’d been asked to share a snippet about my Digital Voices experience. Before the programme I’d have fretted on the train, I’d have tried to write down what I wanted to say, and I’d have worried what people would think. But this time I just took it in my stride, and that’s thanks to what I’ve learnt from Digital Voices. It’s given me an extra support network, and it’s given me the confidence to share my story. I’m a product owner working on the Carers Allowance digital service and since Digital Voices ended I blogged about the service’s development. I’ve also worked with colleagues to relaunch a product owner community called Northern Product People. I was proud and confident to be at the front of that room speaking to a community of peers. I wouldn’t have felt like that before. 🎥 We're at the #ProductPeopleNorth meetup in Leeds today. 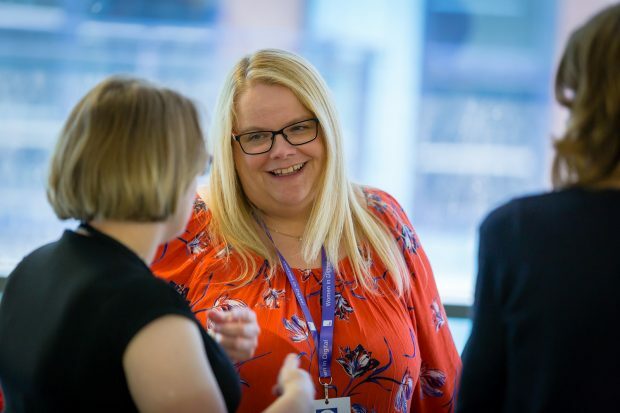 I was also proud to get involved with One Team Gov Global event last July, and I’ve been asked to share my tips on finding your voice as part of International Women’s Day in Blackpool in March. I’m very honoured to have been asked to do that. Overall, I feel like I’ve got a bigger arsenal of tools to help me cope with different situations now. Digital Voices is an opportunity I’m glad I took. There’s not a week goes by that I don’t use something I learnt during Digital Voices. I am chairing meetings more confidently, speaking up at meetings and events, writing blogposts about my work and just generally being more assertive. I’m setting boundaries more effectively and pushing back on unreasonable requests. For example, a late request for something that required 4 hours work at a day’s notice I politely pushed back on, pointing out that someone else’s bad planning was not my emergency, that I was busy and would do it when I had the time available. I would never have been so assertive before Digital Voices, I would probably have done what was requested of me, been grumpy about it and worked late in to the evening to get it done. Digital Voices was a totally transformational experience that has affected all aspects of my life. I am more productive and happier at work and am approaching everything I do with a new energy. I’ve volunteered to work on a group that is raising awareness of ‘Working in Digital’ aimed at schoolchildren in Sheffield, to help promote careers in Digital in the Civil Service, and have just this week volunteered to get involved in Women in Digital in the Sheffield hub. I can’t put into words the confidence that it’s given me and the effect it’s had on my self-esteem and self-worth. You can’t put a value on those things; they transcend work as well and have an effect on all aspects of your life. I look back on Digital Voices as a life-changing experience! Not only did I get to meet and connect with a lot of wonderful women on the programme, but I also got promoted! Before Digital Voices I had just missed out on a job and had got very down about it. I’d convinced myself that I’d missed my chance and that, because of my location and personal circumstances (as a single parent), there were insurmountable obstacles in my way. 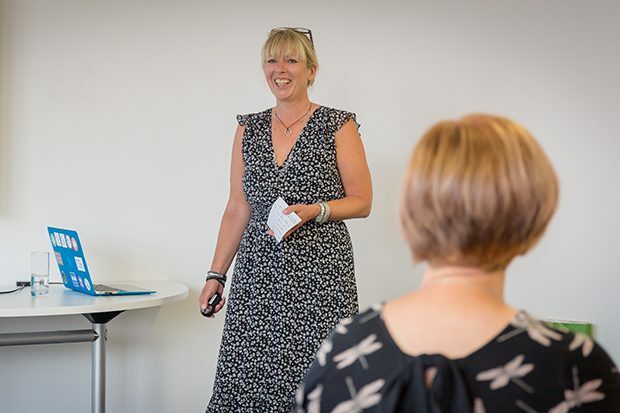 My friends on the programme, the guest speakers and the whole programme (and the things it pushed me to do) built my confidence, showed me I could overcome these things. It made me push myself and the confidence to go for a different role. The experiences and learning I had during the programme also gave me great examples and confidence for my interview. I got the job and I’m now a team leader of 12 people, which is something I really enjoy. And I jump at the chance to get involved in speaking opportunities or networks in my area. I spoke at the CIO+1 event in London with Avril Chester from Cancer Central and main speaker, Gareth Thomas, the Welsh Rugby star. It was a great experience and something I could not have dreamt of doing before Digital Voices. At work I arranged and ran a conference for the 50+ tech support managers in my region and I’ve got involved in the People Engagement group as well as becoming the Wellbeing rep for our region. Digital Voices is an amazing, groundbreaking programme that really helps women like me achieve their true potential in DWP. Like this blog? Why not subscribe for more blogs like this? Sign up for email updates whenever new content is posted!